The most amazing reason to visit Sandusky, Ohio is to see the LARGEST SOYBEAN WAX CRAYON IN THE WORLD! Yes, you read that correctly, I typed the LARGEST SOYBEAN WAX CRAYON according to the Guinness Book of World Records. This modern marvel was made by Dixon Ticonderoga Company, the maker of Prang art supplies and crayons. The Erie County Heritage Society is the keeper of this beauty, so stop on by and check out this HUGE CRAYON made in a single cast. If you have any suggestions of modern marvels around the USA, or the world, let me know! I am always interested in the worlds largest chair, ball of string, Corn Palace, gum wrapper chain, spoon, ya know, the real great World Record holders! Ohio (65) is 2nd only to Wisconsin (89) for the most number of 4-H clubs in the state, as of the time of this post. 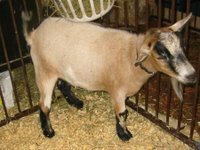 Ohio has a strong county fair tradition and that gives Ohio 4-H clubs great places to show their stuff from home to animal husbandry. 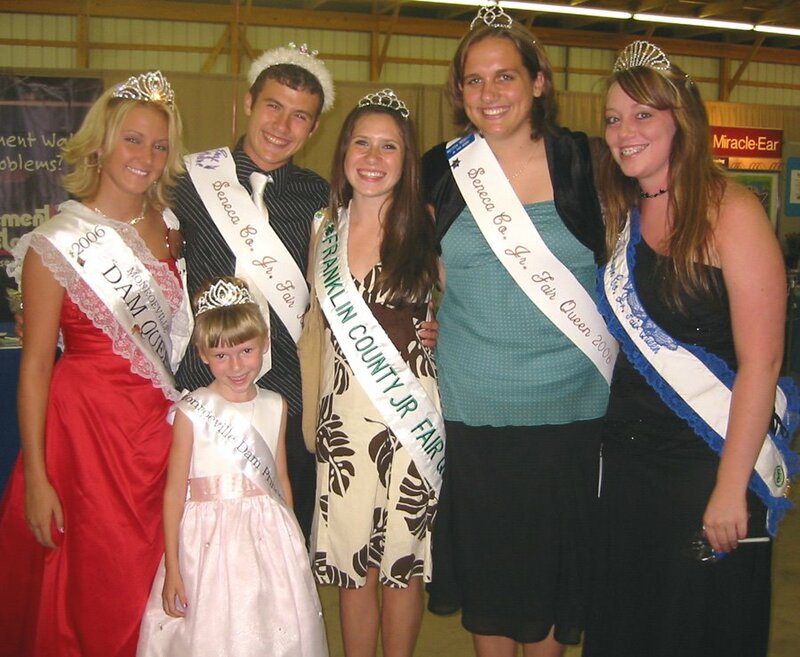 At the Erie County Fair, the Fair Queen and Fair King are members of a 4-H club, and the picture above shows the winners of the Queen and King this year. 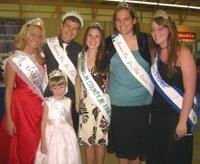 In tradition of good sportsmanship, the Erie County Fair invited neighboring county Queens, Kings and courts to visit the fair for a day. Above, here are the lucky winners of the titles Queen, King, and Princess. As someone who has lived in the biggest USA cities most of my life, I always thought that 4-H was about raising livestock. Now that I have spent a lot of time in Ohio, I have learned that there are many aspects to 4-H including broad categories of citizenship and civic duty, arts, science, Earth, leadership, plants, animals, and family among the big ones. 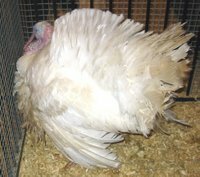 I have also learned that animal husbandry is still a part of 4-H. 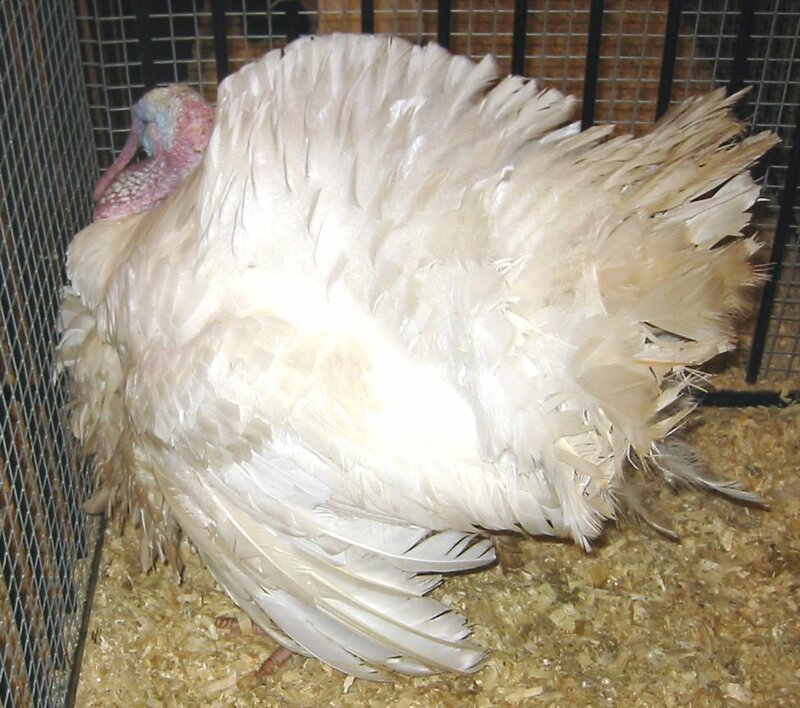 Here is a turkey that I thought should win for being such a fine turkey. 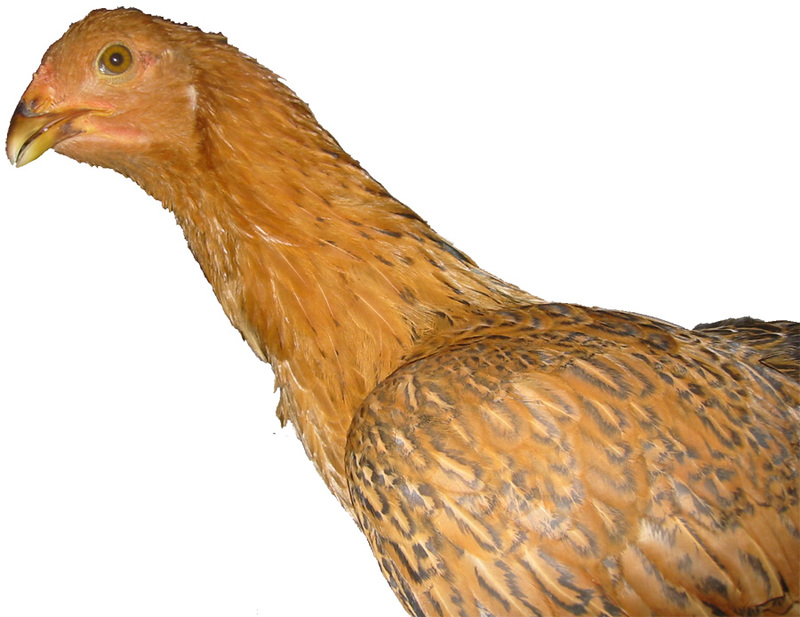 Here is a chicken who looked completely nutty in my view finder. How about this miniature pony? Cute huh? 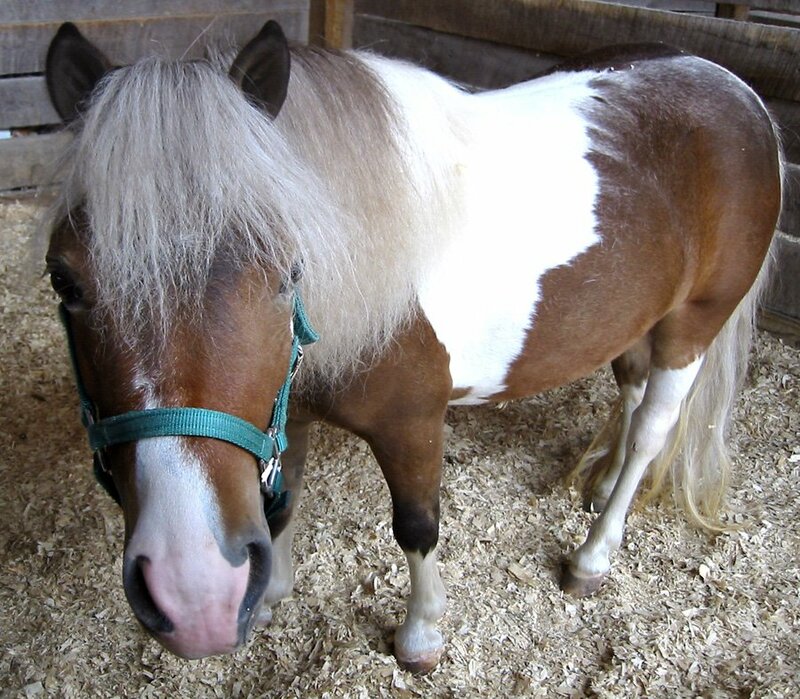 I really like mini ponies. 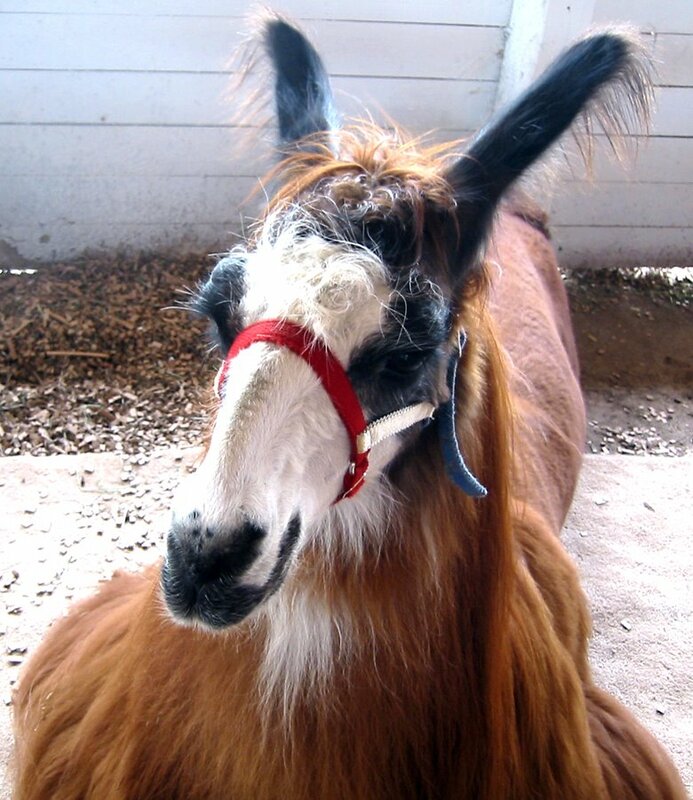 There is a llama competition too. This one was hang out being cool. Now, here is my favorite - Pygmy Goats. They are just so small, cute and quite useful for mowing the lawn. These goats remind me of my kittycat for some reason. 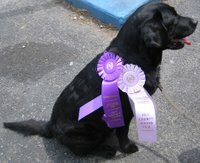 Here is the dog who won for best dog grooming in the Jr Fair competition. 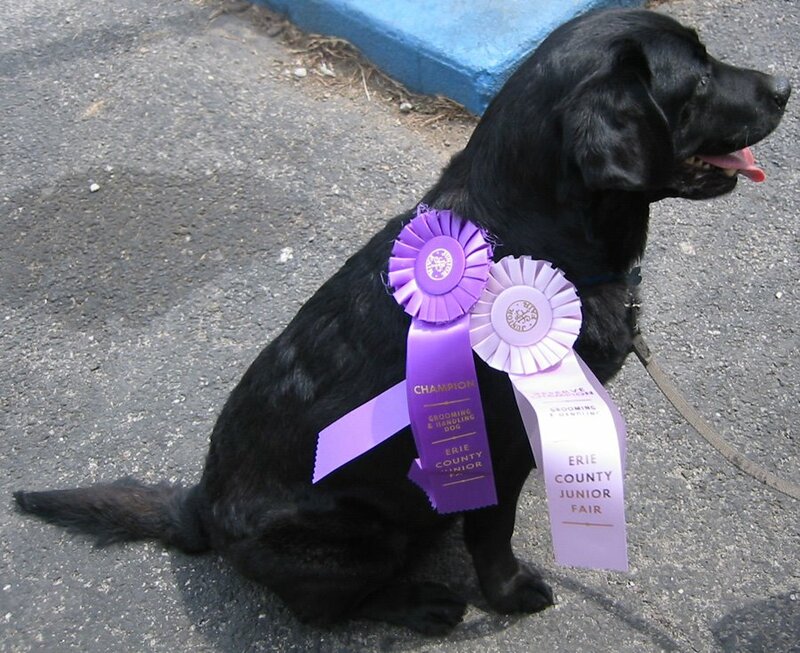 Yes, this dog is groomed quite well indeed! And a nice friendly dog too! 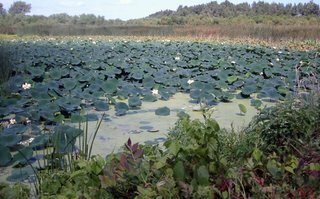 Sheldon Marsh is one of North Ohio's best kept secrets. 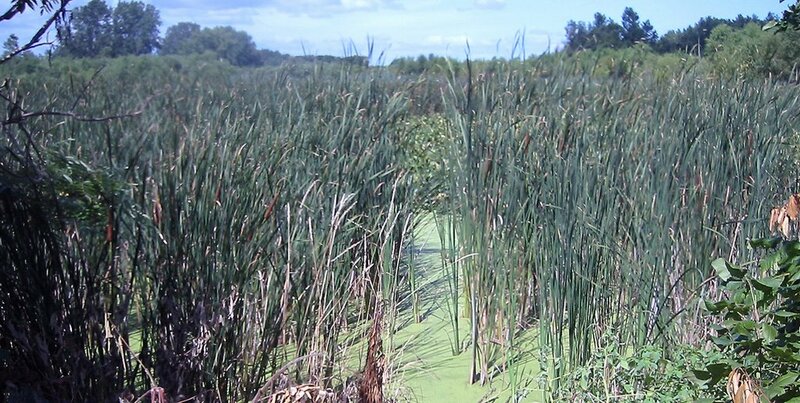 This place is 465 acres of wetland wildlife preserve, and is the location of the original road to Cedar Point. 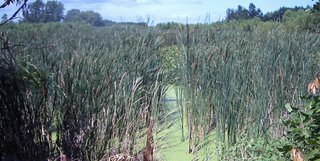 Sheldon Marsh is land that is the closest point to Canada on Lake Erie, so it attracts many migratory birds as a place to rest before or after trying to fly into or out of Canada. After the road on this land was washed out time and and again, the people of Ohio got wise and let the land return to a wetland, and the Cedar Point Rd was moved to about a mile closer to the Cedar Point to an area that would not flood. Once most of the old road became part of Lake Erie again, the upper part of the road stopped getting flooded. 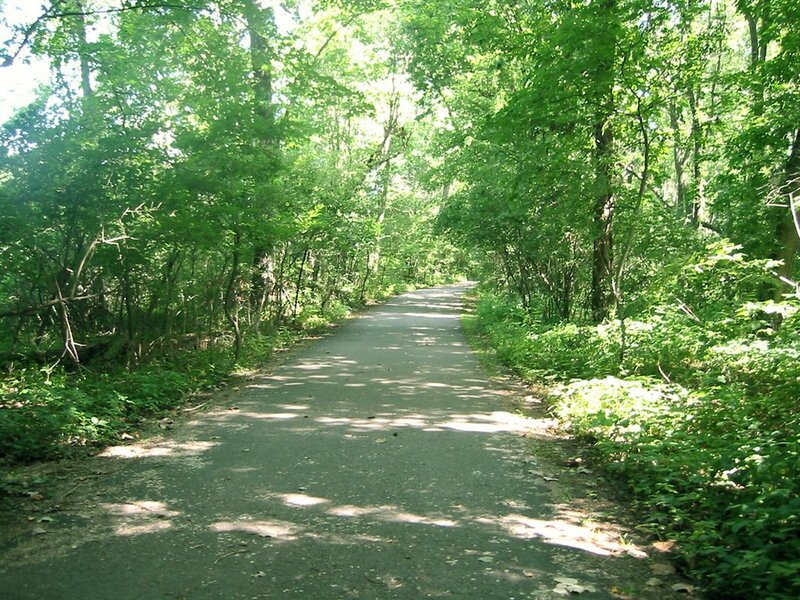 The upper part of the road is now a one mile foot path, and it perfect for a nice jog, and off to the the sides of the foot path are shorter wildlife trails and scenic overlooks. 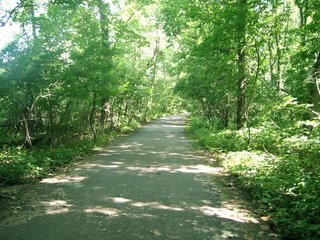 This is the foot path I jogged everyday to work off the fries, hotdogs, and brats I ate at the Erie County Fair. It was perfect conditions for a jog. 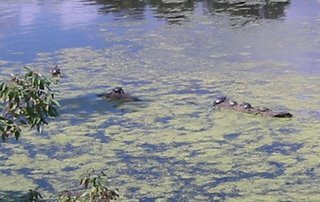 These are the turtles I get to see sunning themselves on a log. They are just so cool looking. Here is a view of one scenic overlook. There are carp that live in the water, and you can hear them jump out of the water sometimes. The water is rather shallow, so it is possible the carp are trying to swim, but hit the bottom while flipping around. Here is another overlook view of giant lilly pads. I just missed a picture of a heron. They are just really fast birds. Once they here the shutter open, they are on the fly. 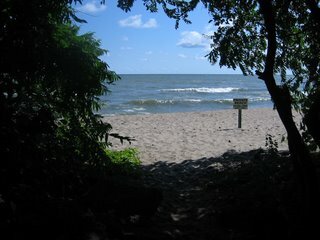 At the end of the foot path, there is the beach to Lake Erie. Yes, people actually do swim and hang out on the beach. There is a tidal schedule for Lake Erie, there is an under-tow, and the lake is so big that you cannot see to the other side. The sand is actually sand, not rocks. I think that Lake Erie is the best kept secret of summer vacationers because it is less expensive than the Hamptons or the Cape, and there is a Norman Rockwell small town feel to this place. 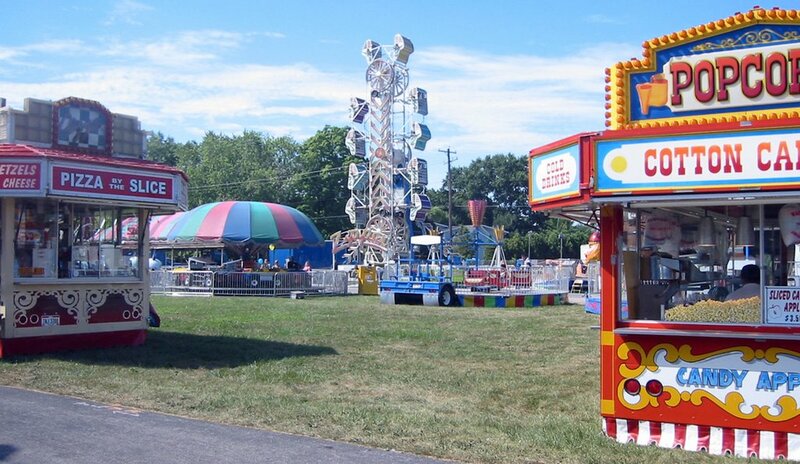 Every August, I work in Sandusky for a week, and I get to go to the County Fair. Sandusky is in Erie County, and is right next to Lake Erie. The weather was great this year, about 78F for the high, low humidity and plenty of sunshine. 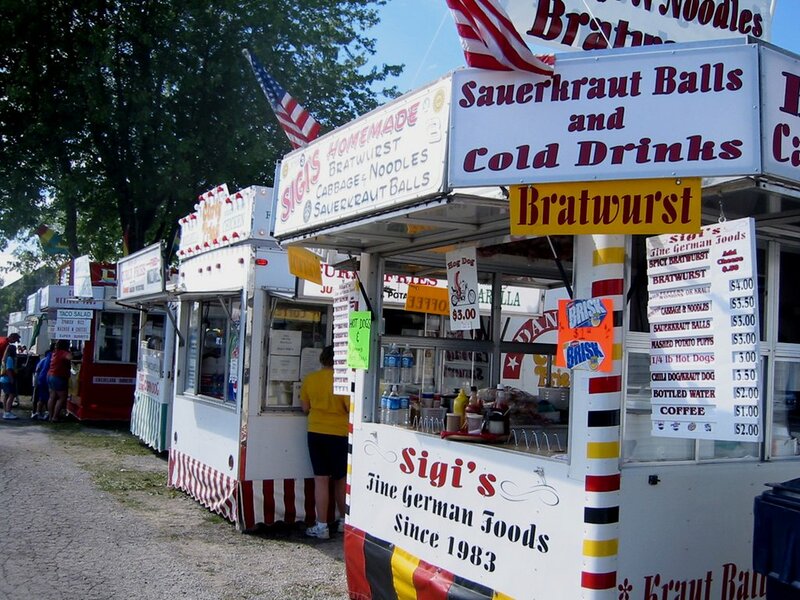 Because this is a fair in an area where Polish immigrants settled, the fair is lucky to have a local vendor for brats, sauerkraut balls, and cabbage and noodles. There are other fair food favorites like corn dogs, soda, ice cream, shaved ice, hot dogs, french fries, spiral fries, fried cheese, lemonade, kettle corn, pizza, funnel cake, waffles, candied apples, and many other choices. 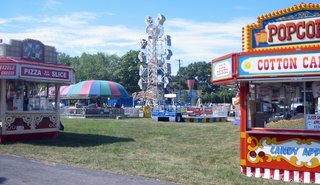 Pizza, popcon, cotton candy, candied apples to eat before riding the Zipper! Everything is funner on a stick, look at how fun a corn dog is! On my last day of my whirlwind trip to Chicago, Cook County, and surrounding counties of Lake, DuPage and Kane, I was looking for some good Indian food. I went straight to Blogger and typed in "Indian Food Chicago" and what people were writing about was India House, so I went there for dinner. What I found was the India House building in a strip mall, as there are many strip malls all over the 'burbs of Chicago, and the building had a banquet side and and a restaurant side. The banquet side was quite similar to the Acropolis Banquet Hall in New York, except that the decor is of India style, and the the food is Indian. 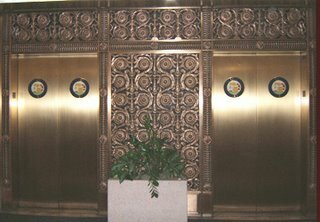 There were these ceramic pillars outside the function room doors similar to Greek columns, but the design was intricate with many colors in a design you might associate with wedding henna hand designs. I entered the restaurant side and the waitstaff was very nice. The service was friendly, and it struck me because most of the service in Indian restaurants that I have been in Nashville, Boston, New York, and Los Angeles have been the surly at best. The waiter came immediately with cut up pieces of Naan and a red cream dipping sauce. Now this Indian restaurant understand the suburban American way of dining, being that there has to be a bread basket, chips and salsa, fried noodles and sweet & sour sauce, or other munchie on the table. 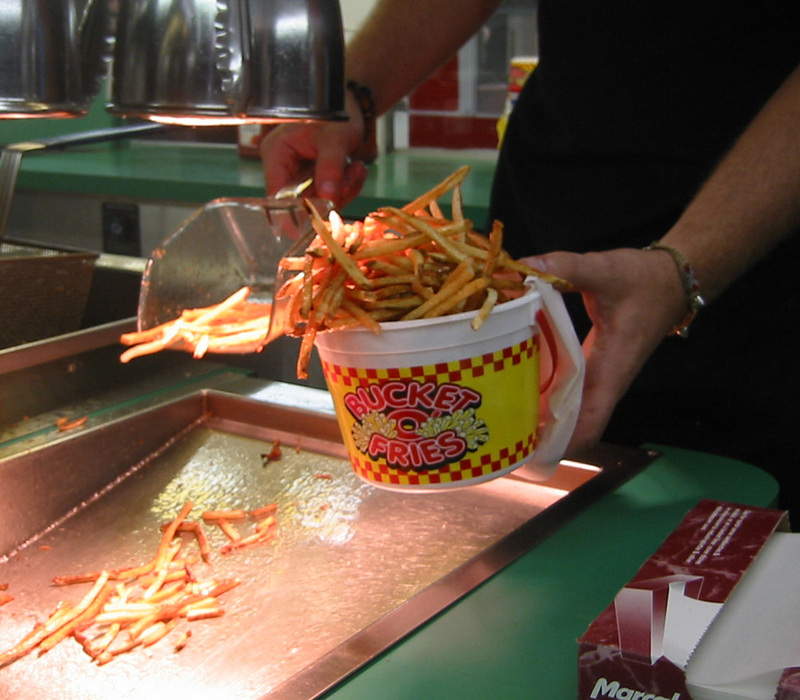 The average American restaurant serves way too much food, yet for some reason, the American dining psyche expects to have these free baskets of food before ordering a meal anyway. Anyway, this free offering is going to solidify a lot of the local suburban folks to go back again and again. All of the meals came with a side of jalapeno peppers, onions and lemon. I thought that was a great idea, and a great marketing ploy. I enjoyed it for what it is worth. 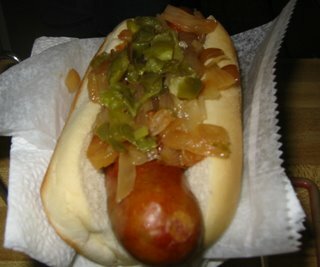 I love assembling food, and playing with food, so adding lemon or onion or peppers to each bite was really fun. When I ordered my meal, I ordered what a French woman, who blogged about India House, orders. She orders a chicken dish with a tomato butter sauce and began bertha eggplant. The deal is, I needed to order 1/4 of the volume of food. The portions here were so big that I ordered enough for 4 people. The food was fine, but a bit heavily salted. But what impressed me was all the other external things about this restaurant that says the owners and managers "get it" when it comes to serving Americans who dine out. The restaurant was tastefully decorated, the tables were covered with cloth, the chairs were of dark wood, the service was like that of a fine steak house, the plates and serving dishes were crisp and visually appealing, and the cost per dish was appropriate. They also seem to do well with families and business dinners. India House is a small local chain in the Chicago area, and I am really routing for them to do well. It is really great that an Indian owned restaurant understands the American dining casual model and can win at the restaurant game without giving up traditional recipes. I always want good ocean seafood when I can get it, and that is what I truly miss by moving inland from Boston. Nashville, where I live, still is behind the eightball when it comes to ocean seafood. At one restaurant in Nashville, claiming they are an Oyster Bar in the name, I asked the waitress what variety of oysters were being served. She said, "we have two kinds, fried and raw." Not what you want to hear, so I opted for fries and ribs. Anyway, I know that at one time Lake Perch was the "seafood" of choice for Chicago, but now with quick trucking and air shipping, Chicago can hold its own against any eastern seaboard city when it comes to real seafood. 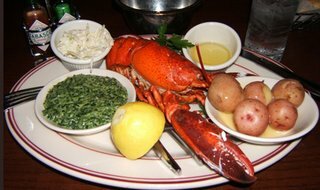 I did a tripadvisor.com search for seafood in Chicago, and what came up was Shaw's Crab House and Oyster Bar. 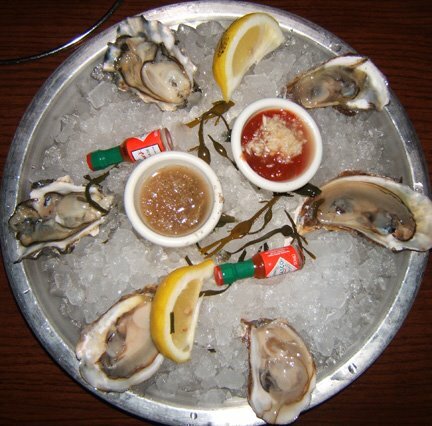 The deal here is that the Oyster Bar side of the restaurant is less expensive, and it more casual, and the Crab House side is expensive and more sit-down. I am not made of money, so I went to the Oyster Bar side, and dinner was surprisingly good! I asked the Shaw's Oyster Bar waitress what types of oysters they had, and I was told the variety and where they were harvested. Ah, that is what I want to hear. I opted for 2 Salt Aire from Prince Edward Island (top left) , Malpeque from Prince Edward Island (bottom), and Penn Cove Select from Penn Cove (upper right). Yum. Very fresh and I wish I had more. 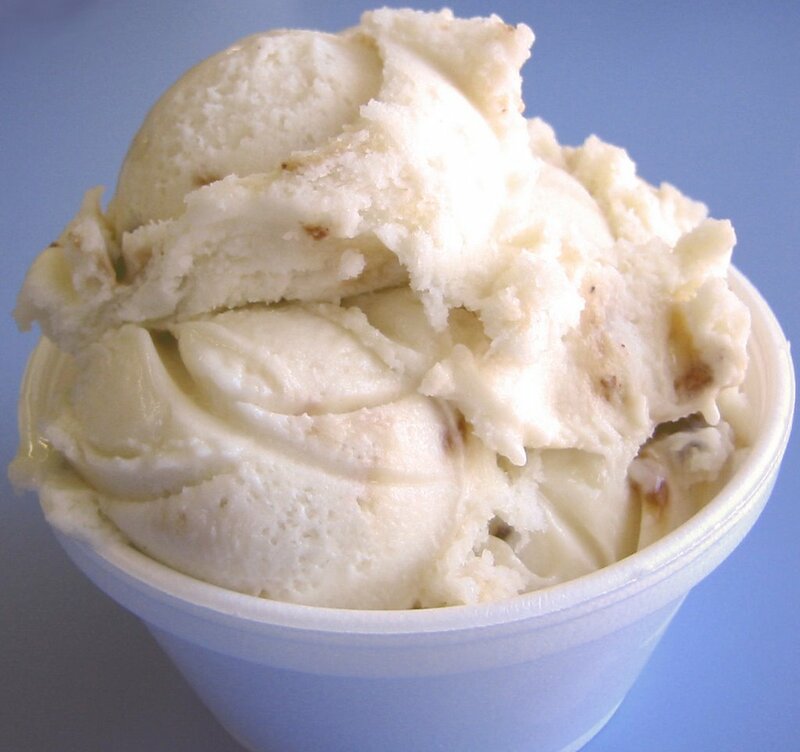 I also tried their home-made New England Clam Chowder. Yup, it was freshly made with real cream. I could feel my arteries hardening , but I continued on eating the soup because I liked it. I have to say, that Boston's Durgin Park Chowder is always the best, but it would cost me at least $750 spur of the moment RT to fly up to Boston, and $5 in T fare, and $5 for a bowl of Durgin Park chowder. 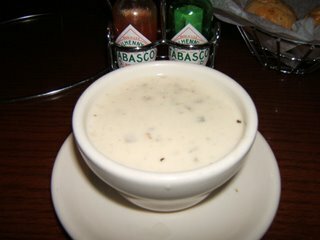 To get the best chowder is a bit cost prohibitive for me as long as I live in a place that is not Boston. I finished my seafood odyssey by having a 1 1/4 lb lobster. To my surprise, it was boiled to just done, and NOT over done! Wow! I was not given a lobster bib, so I did get some lobster stuff on me, but it was a decent price to pay for a well prepared lobster. Usually, midwest restaurants over cook lobster to tasteless rubberiness, but Shaw's Oyster Bar did a great job just to cook the lobster for the few minutes it takes to just get done. I went in expecting a midwest ruination of seafood, but I came out one happy HAPPY former New Englander with a happy belly of lobster, oysters and clam chowder. Here Todai, Gone Tomorrow. In the Chicago suburb of Schaumburg, there is the destination Woodfield Mall with Ikea behind it and another huge upscale strip mall in front of it. The Woodfield Mall is huge, and has every store you could want, and all the biggest chain restaurants in it, including one restaurant called Todai, pronounced Toad-eye. 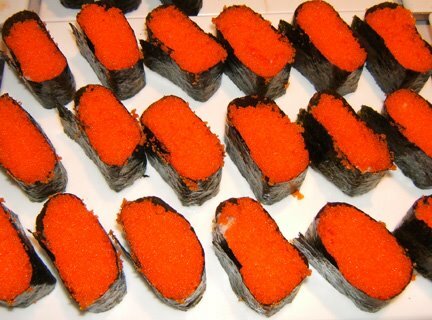 It is an all you can eat Japanese food restaurant, with the most udon, desserts, teriyaki, sushi and sashimi you could eat. During one trip in the winter, I went with my cousin, her husband and her 2 boys to Todai on a Saturday night at 5 pm just as they restaurant opened. 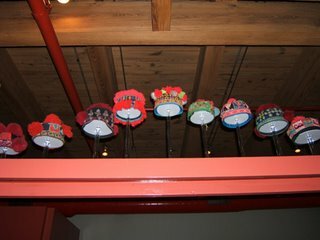 The line was out the door, and the excitment built in the crowd as each party was seated. The boys, who love sushi, snails, fruits and veggies, were just beside themselves as we made our way to the front of the line. It was a fun experience with the boys, and neighboring tables because there were a lot of happy and fun people tasting freshly made sushi at a volume of all they could it. 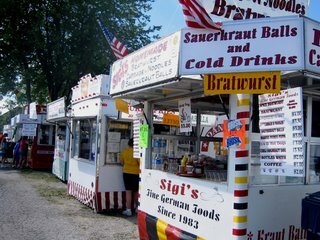 The excitment in the air was similar to that of tail-gating at a Big Ten Football game with the best Big Ten fans ever. The price was right, it was only about $25 for whatever my heart desired. On occassion, at other sushi restaurants, I have spent way more than $25 when I am able to get abalone or oh-toro. Then, fast forward to this summer, a few weeks ago, when I found myself working in Schaumburg on Tuesday, and I hopped on over to Todai. I was remembering that fun time I had over the winter and I was looking forward to a similar experience. What I found was a 20 minute wait to be seated at this nearly empty restaurant the size of a football field because the hostess was too busy flirting with a co-worker while they sat at an empty table. 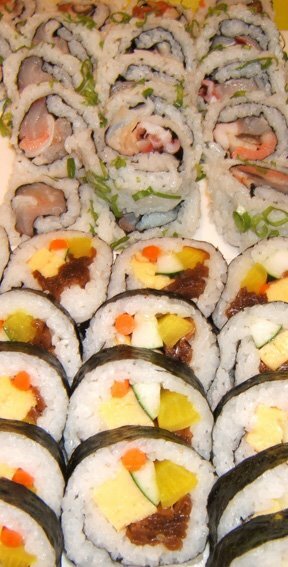 There was low turnover of product, so the sushi was sitting out getting funky and too warm, and the teriyaki was getting that buffet tough dried edge to it. No one came by to ask me about drinks, so I ended up going to the waitress station and pouring myself my own glass of water. The employees of the place were purely rude and slacker like during this Tuesday trip. I have no need to re-visit Todai or recommend it to anyone. After departing that Tuesday's horrible dining experience, feeling burned that I spent the $25, I got on the internet to see what others had to say about Todai. It was exactly my experiences. Half said good, and the other half hated Todai, and called it a waste of money and time. I guess the only time to go is Saturday for dinner when there is a lot of product turn over, and when other diners are happy. I really don't want to write about bad experiences, but my 2 experiences were completely polar opposites, and I thought it was note worthy to write about both of them. I spent the whole day in the Cook County Clerks office in Chicago. What a lovely building the people of Chicago own. Look at the elevator door detail, quite fab if you ask me. My interaction with the young new employees (kids) versus the old timers was startling. The kids just don't know how to retrieve information on paper, they had to have the PIN to look it up on the computer. Well, property transfers before 1951 are not in the computer, so the kids did not think the property existed. Anyway, one old timer knew where the property recorder books were, and I was able to get the info I needed. After thinking I needed to tell the kids about the slide-rule and t-squares of my day, and having to do math in my head and not on a calculator, I was hungry and called up my friend Bea for dinner. Bea is a fire eater, and last time we had dinner it was full of crushed Asian red peppers. I was not sure what was in store, but it was going to be tasty because Bea is all about the food. We walked up to Michigan Ave to The Star of Siam. This was a very nicely decorated restaurant with a lot of natural light, exposed beams and tastefully homey decorations. Since Star is a Thai restaurant, I was thinking we were going to eat fire again, but Bea said she would give me a break on the red chili pepper heat this time. We started off with a little chicken and beef Satay and peanut sauce withe a side of cucumber salad. Yum, everything is better with peanut sauce. Will peanut sauce ever become the new salsa? 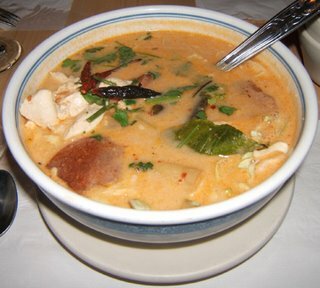 Then we had Tom Ga Kai soup for 2. The bowl they brought to us was easily meant for 4-6 people. The soup was packed with chicken, Asian green veggies, a couple root veggies I am not familiar with, and mushrooms. Fresh, fun and good. Our main dishes were generous portions of Basil Beef with Tomato, and Chow Fun with veggies. I love Chow Fun because they are extra wide rice noodles that have a good teeth feel, and lightness in texture. Also, how can a food with the word "fun" in it, not be fun? Huh? I make a good point huh - it was fun. The food here tasted good to me. The dishes were brought to us piping hot, and freshly made. There was no holding back dishes under the heat lamp (too much time under a heat lamp ruins a perfectly good dish). The shocker was the prices for these dishes - ALL of our dishes were UNDER $10. For about $17 per person we walked out of there stuffed to the gills, and with leftovers that were enough for 2 big meals for Bea for later. Michigan Ave is so over-priced, and it was boggling my mind how this lovely Thai restaurant could be so reasonable priced, tasty and a haven from the pretense of the expensive shee-shee shopping district. I really liked my experience at the Star of Siam because I felt cool walking around Michigan Ave, it was nice to be served well by hard working waiters, and it was surprising to pay a paupers penny for the luxury of it all! Ms Cheap would be proud! A couple years ago, when the Cubs were in the play-offs for the world series, we went up to Chicago and found ourselves in a sportsbar Chicago Pizza joint in Wrigleyville. This dining experience was definitely Chicago fun and magical. Everyone was in a great mood, we all cheered for the Cubs, we raised a glass for good luck, and had the most awesome Chicago deep dish pizza. 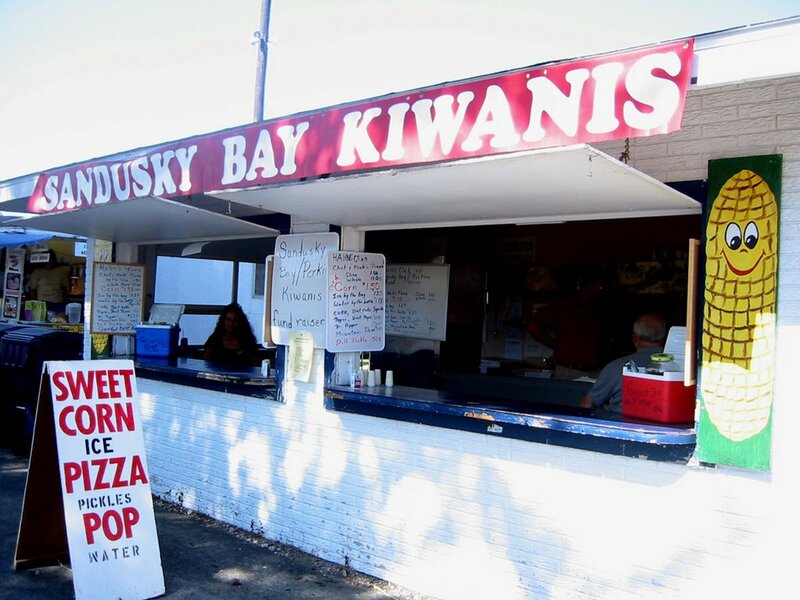 The crust was olive oily, the chunky tomato topping was just the juicy perfection, the cheese had a good long stringy quality, and the there were tons of pizza ingredients stuffed into the middle. Was it the cheap beer, the crowd cheering and the Cub’s winning that makes me think so fondly of this pizza, or was it really the holy grail of Chicago deep dish pizza? Regardless of the reason for such fond memories of this meal, it is my gold standard that all other Chicago pizza joints must live up to. 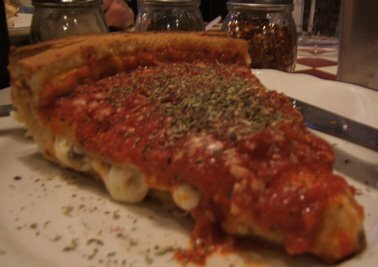 A few weeks ago, I was in Chicago again, and while I was there, I did a little taste testing of the 2 big Chicago chains of deep-dish or stuffed pizza. 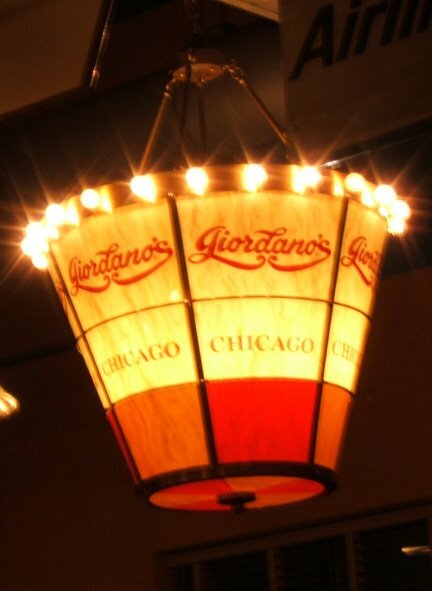 The big two are Gino’s East and Giordano’s. I was hoping to find that magical pizza experience like I had a couple years ago. 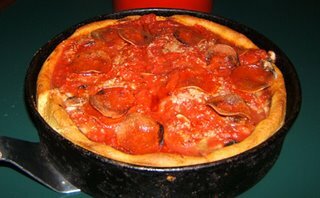 The first day in Chicago, I asked the guys in the Chicago office where I might find the good Chicago deep-dish pizza in the area, and they directed me Giordano’s World Famous Stuffed Pizza. Off we went and we ordered a cheese, mushroom, pepperoni and sausage pizza, and the waitress told us that it would take 45 minutes to be served because they make each pizza to order. The pizza had a lot of cheese, about 3/4 inch of cheese and not all of it was melted to its stringy goodness, and the cheese seemed to drown out the flavor of the other ingredients. Since there was very little tomato puree on top of the pizza, even with all that cheese, the pizza was a bit dry. The crust was a bit dense and it felt like some tooth tartar was scraped off while trying to bite into the crust. The wait staff was great, but the pizza was only ok, and the pizza did not hit me in a way that I would have a driving need to come back. 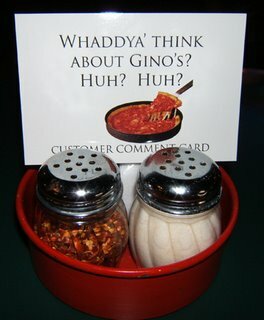 The next day, I scanned the internet for Chicago Pizza, and found Gino’s East. I went on my own because who would want to deep-dish pizza twice in a row? I got the Gino’s Supreme that had cheese, sausage, pepperoni, onions and peppers in it. Again, there was more cheese in one slice than the RDA of cheese for a month. This pizza was hot, oozy, and had a really nice chunky tomato topping to it. There were enough of the other ingredients, so their flavors came through. 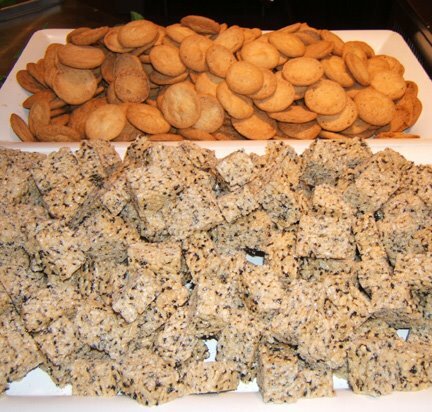 Gino’s crust is a light yellow color, possibly with a little cornmeal in it, and it had a slight southern biscuit texture making it easier to bite into and chew. I liked this pizza, and I may go back to Gino’s East the next time I am in Chicago. I want to keep my blog mostly about where I eat, but every once in a while there are things that are too good to pass up. Here is a concept, for a minimum of 8,650E you can have yourself and 21 of your friends strapped into chairs, then hoisted up above the roof tops in open air seating. 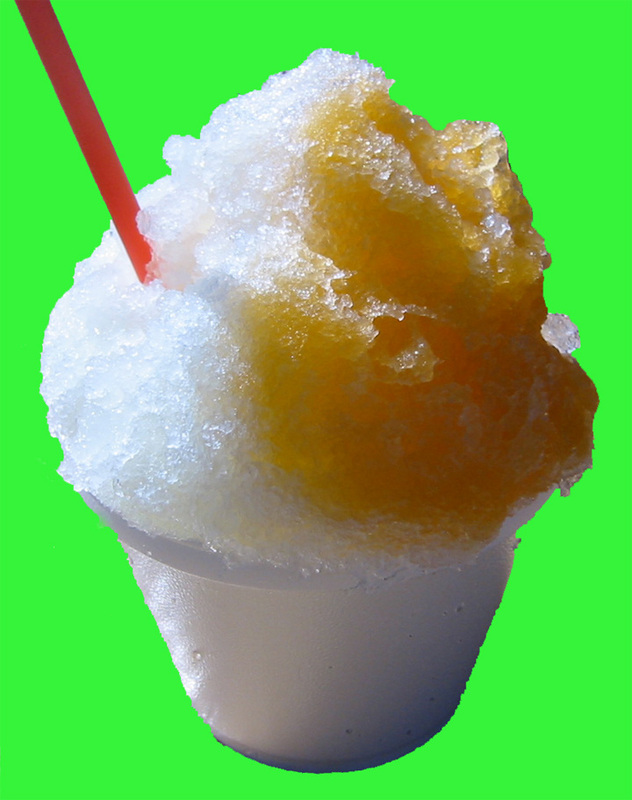 If you want necessary parts of a dinner party like beverages, food, staff, power, light etc. those are add-ons. The dining event is called Dinner in the Sky, and for some reason I think that it is cooler in concept than in it is in reality. It looks like dinner guests get strapped in to a chair similarly to a carnival roller coaster ride. The whole table assembled gets hoisted up, chefs are standing in the middle of the table to be able to serve dinner, and the dinner begins. What happens when a guest drops a fork or napkin? Look out below! What happens if one guest has to use the bathroom? What happens if a guest gets sick to their stomach from the constant swaying in air, and has to hurl overboard? What happens if a guest spills a glass of wine? What happens if a guest really wants to get up and walk away from the neighbor guest? It appears this concept is only in Europe, and when will be come the next Mc-Mega-Chain restaurant shtick in the USA? As I have said before, and always request, I want to go to Margot's for my birthday. Last year, I was conned into being taken to Another Restaurant for my b-day because I always want to go to Margot's and I should try something different. What happened at the Other Restaurant was that the food was not consistent, the 1st try was over-cooked, dried out, burnt, and arrived late to the table and cold, so I had to send it back. 2nd try was hot but had no seasoning (duh salt and pepper at minimum dudes), obviously missing ingredients, and bland. I was making me upset to see 3-digits of bills being bleed from the wallet for a seriously sub-par meal and dining experience. I actually cried over the loss of all that money that could have become part of a down-payment for house, car, or vacation. Matt then tried to take me to a few other places during the month of August 2005, but all I want is to go to Margot Cafe. 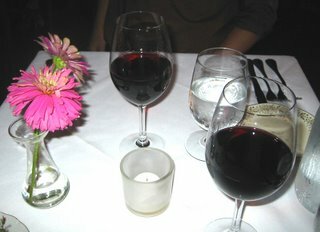 Finally, after the 4th non-Margot try, I told Matt in clear language, "I want to have my birthday dinner at Margot's. You can keep depleting the retirement fund, but the drain can end by going to Margot's, or a place that is just as good as Margot's. The only place as good as Margot's is Margot's, so I want to go to Margot's." Fast forward 1 year, Matt got smarter, and he actually heard me say (and type in my blog), The ONLY birthday dinner I want is at Margot's. The one and ONLY birthday dinner 2006 was at MARGOT'S! I am so happy!!!! WHEE!!!!! #&(@#*)%* Happy Happy Happy! I think that Margot's is the best prepared food of any restaurant anywhere. 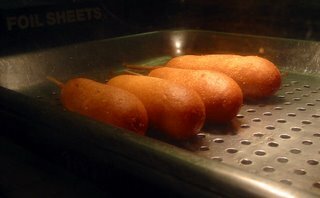 I have lived 3 of the top 5 dining cities in the USA, and I insist that Margot has better technique and consistency than any of the restaurants in those cities. I will say again, my standing order for my B-day dinner is Margot's! See you there in August 2007. About my Birthday Dinner 2006, the menu is Simply Delicious! We started with fresh sweet corn soup with a basil puree, and fresh sardine salad with arugula and EVOO. 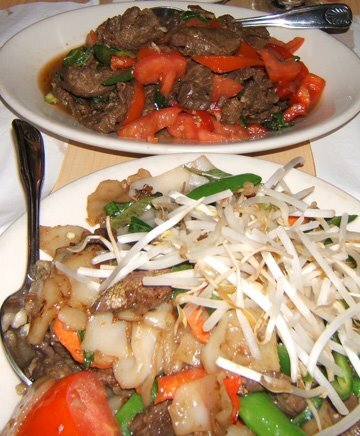 Both were made with best freshest ingredients, which translated to awesome 1st dishes. 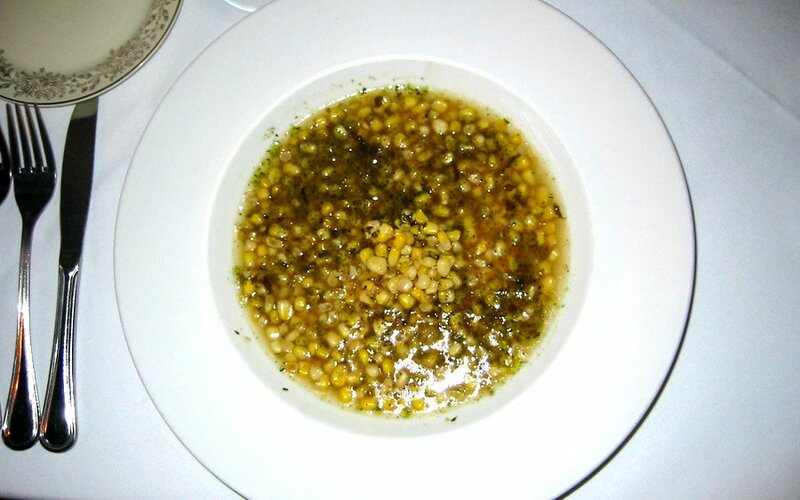 The corn soup had a lovely basil aroma, and the corn kernels had a fresh sweet crisp pop to them. The sardines were buttery, smooth, and perfectly matched with the arugula. I have never had fresh sardines, and these were exceptional. 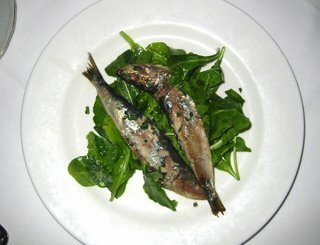 I can see why people would have orginally eaten a sardine, as these were magical. The sardines in a can... well, it is like fresh tuna sushi vs canned tuna. 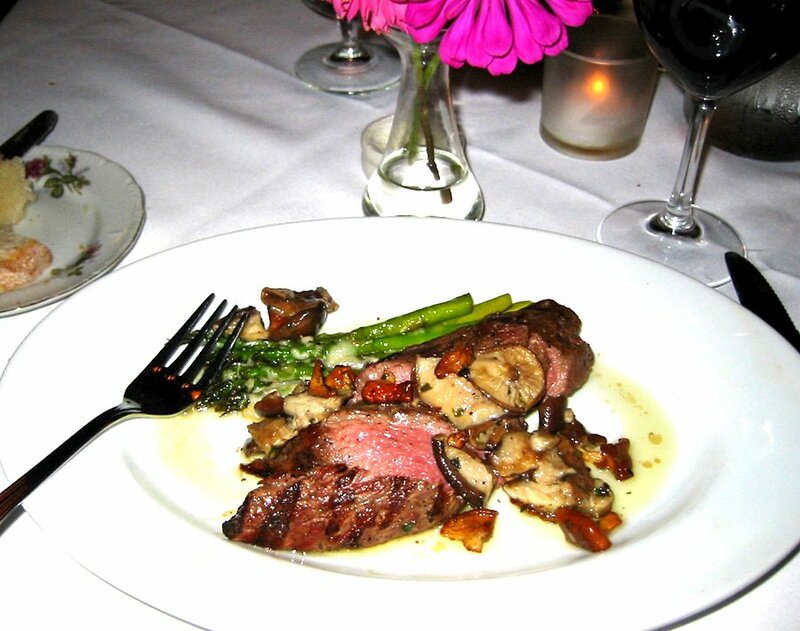 For the main dish, I had the tender steak with chantrelle and baby shitake mushrooms over roasted asparagus. I asked for the steak to be cooked medium rare, and Margot's is the only restaurant in Nashville that actually delivers a medium rare steak. Fantastic! Wow! Make me happy! The portion size was perfect, where it left me feeling satisfied and wanting to visit Margot's again on some other day. Of course it was my birthday, and what would a birthday be without dessert? I am not a huge fan of cake, except for my neighbor's (2-doors down) cake, and she is the Tennessee State Fair Cake Making Blue Ribbon Champion. C'mon, how could her cake not be yummy? 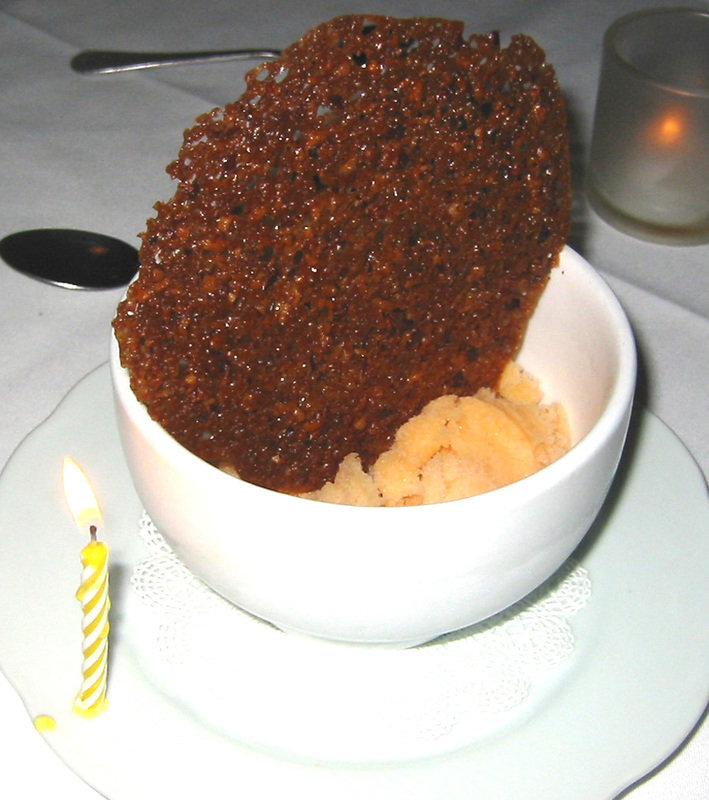 So at Margot's I opted for the cantelope sorbet with a pecan tuille. Oh, what a fresh, light and refreshing way to end my birthday dinner. All good meals have to come to an end, as this one did. This birthday dinner was so good! As I was leaving Margot's, I would have skipped happily to the car, but I just ate dinner. A few years ago, the Copper Kettle had a fire and shut its doors in the little David Lipscomb shopping center, for what I thought would be forever. There were promises that this eatery would re-open in 6 mo, 8 mo, 10 mo, 1 yr etc. As every month of time clicked on, I thought this place was a goner. During the time of renovation, The Copper Kettle opened in the old TGI Friday's (or was it a Ruby Tuesdays?) location at the Dead Mall in Bellevue. 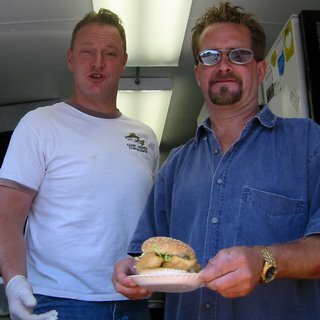 We made that 20 mile pilgrimage a few times, and it never felt quite right eating there in the mall. I really do not like malls, and even the Valley People Mall Rats (aka suburban mall makers) don't think much of malls either. The famed Galleria Mall completely shut its doors in the 1990s due to low shopper attendance, and you may know that mall from the fabulous 1983 movie "Valley Girl". Thank goodness the Copper Kettle is back in business at its orginal location, with all its comforting charm. So, we went on Sunday for brunch at the good ol' location on Granny White. 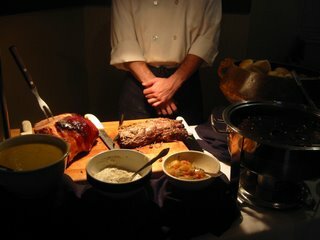 There was a carving station of ham and beef tenderloin. The Tenderloin had mushroom sauce and horseradish if you care to put it on your beef. 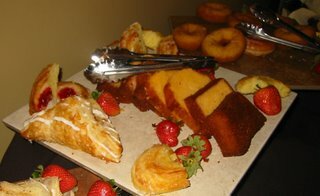 There is a bread and donut station. C'mon dump the no carb diet, mmmmm! There are lots of hot items like eggs, sausage, potatos au gratin, and tons of other stuff. There is also grilled veggies, salads and fruits if you care for variety. 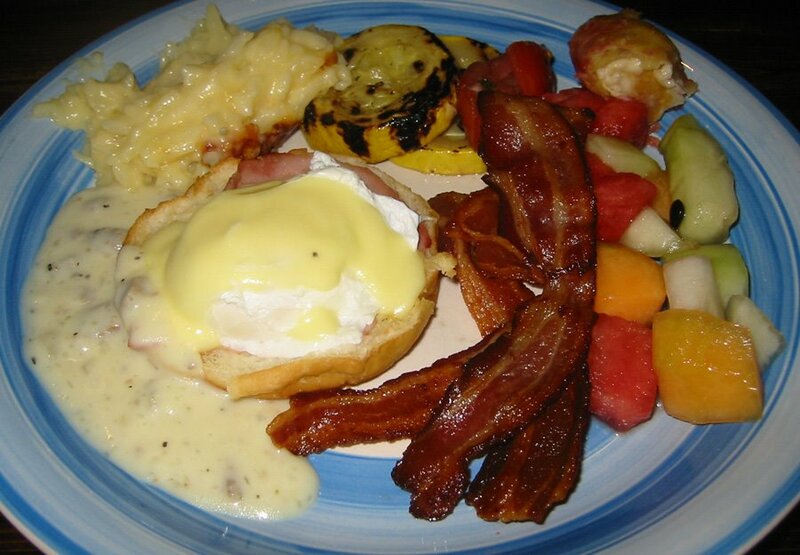 There is also eggs benedict and bacon. Mmmm Bacon! 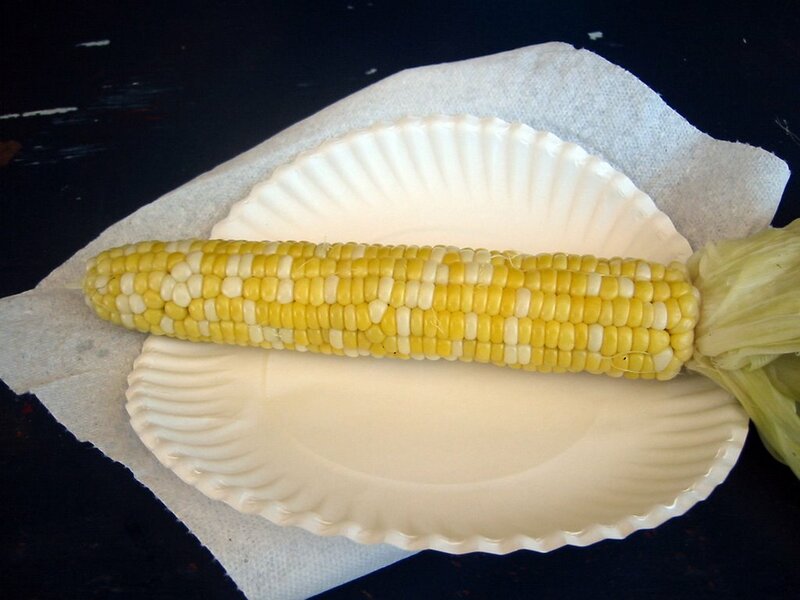 Here is my plate I made for myself. 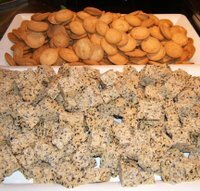 There are also a bunch of desserts too. It was delicious. I generally don' t do buffets, but I will go to this brunch buffet. Everything was fresh and yummy. Yay! Thank goodness we do not have to travel to the mall anymore! Thank you Copper Kettle for leaving the dark halls of the mall, and making your old home new again!